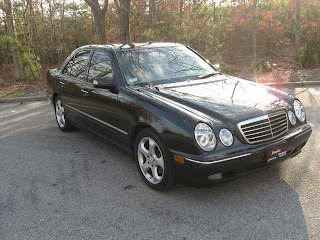 Today's Pumpkin Cars, fine car of the day is this gorgeous 2002 Mercedes Benz E320. This car has a sleek black exterior with a stone gray leather interior. It has been impeccably maintained and has been only driven an average of less than 10k miles per year! The previous owner of the car is a Pumpkin Cars Employee so we know in what great shape it was kept. Even though he is downsizing, this is a great luxury sedan for anyone. 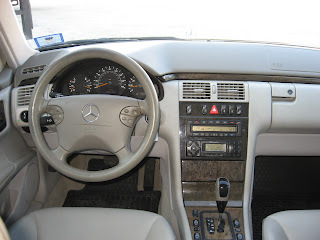 This car recently had a full tune up including new spark plugs, wires and has plenty of features and Mercedes Benz Luxury. It also comes with a One Year or 15k mile extended warranty! This E-class is barely broken in at 88k miles and has the Elegance Package with 17" stock wheels, Power/Heated seats and a power moon roof. This is an extremely great value right now priced at $11,995 as is the rest of our inventory. This is a car that brand new will cost you upwards of $50,000 and it can be yours right now for under $12,000. No where else but Pumpkin Fine Cars can you find a car in this top notch condition, with low miles and priced very aggressively. This car has been fully serviced, test driven by Franck Freon himself, fully detailed and it is ready to come home with you today and treat you right for a long time. This is all done at part of our uncompromising commitment to our Pumpkin Certification Program and providing the highest quality pre-owned cars in the industry. Come by the our unique indoor showroom today and you will see what makes a Pumpkin Car the best kind of car! Pumpkin Cars is available over the phone at 609-646-7676 and via email at [email protected] . You can find and "Like" Pumpkin Cars on Facebook, follow the tweets of @PumpkinCars on Twitter, view videos of our great inventory and showroom on YouTube and if you enjoy what you have just read, please subscribe to our blog. We're here on Fire Road!! Pumpkin Has Loads of Cars Under $10k!! !